Allen Roofing has over 30 years’ of experience repairing and replacing roofs in the Lincolnshire area. For your peace of mind we operate an Emergency Call out Service and guarantee to attend within 2 hours. Each roofing project begins with honest and reliable advice backed up by a free quotation to ensure you are completely happy before work commences. A natural product that is hard wearing and fire proof. 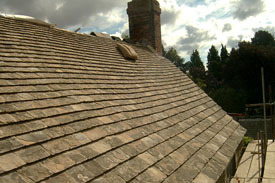 It’s not unusual to find a slate roof that is over 150 years old. Slate comes in a wide range of varieties, thickness and colours so it’s important to make the right choice to match your property. 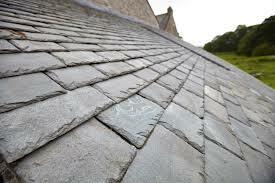 Fixing slate tiles is a skilled job; all our roofers are experienced working with Slates. With a wide range of colours in either concrete or the more traditional clay we can match and repair, strip and re-tile or undertake a complete new roof. Leadwork and flashings can deteriorate over time, allowing water to seep in. Allen Roofing can remove existing lead and replace it with new appropriately coded lead, re-pointing and re-tiling to match your existing roof. Chimney stacks need maintenance too and may require re-pointing to stop rain penetrating the brickwork and causing damage. If you notice that the mortar between the bricks on the chimney has weathered call Allen Roofing to make the necessary repairs, safely and effectively. Allen Roofing has flat roofing specialists. We can install many different types of flat roof. We only use good quality materials to ensure your flat roof performs as expected, keeping out the rain for many years to come. © 2018 Allen Roofing LTD All Rights Reserved.